With the release of the company’s S-1 filing today, Snap revealed that at the end of 2016 the company had 158 million daily active users who spend 25-30 minutes a day in its app on average. 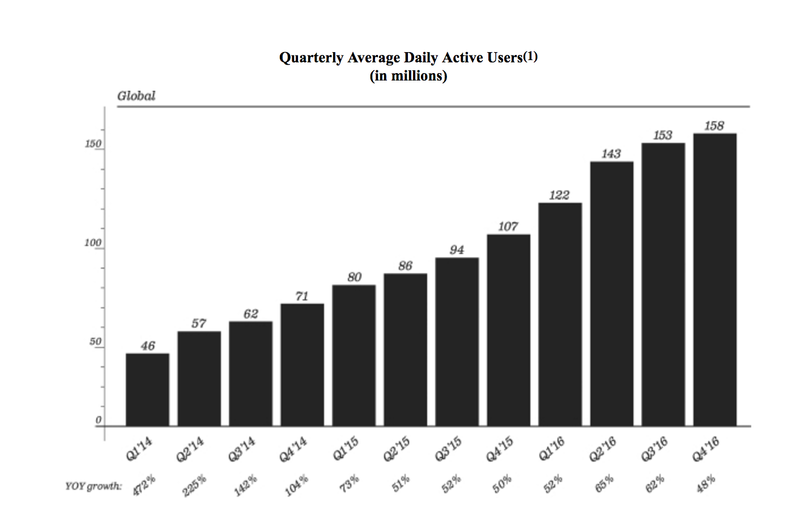 Its daily active user numbers are up 48 percent from 103 million during the same period in 2015. That said, its user base in Europe and the rest of the world were up year-over-year, but growth slowed in the second half of 2016. 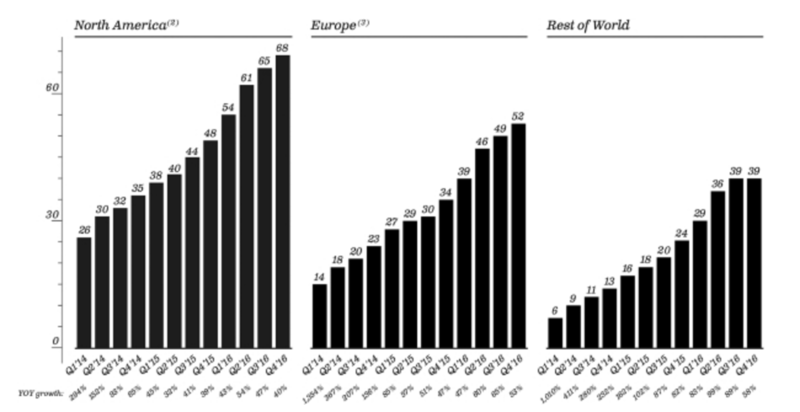 In Europe, daily actives increased from 53 percent year-over-year to 52 million, while DAUs in the rest of the world grew to 39 million, a 58 percent increase over the prior year. But just looking at the graphs you can see pretty stagnant usage in the last two quarters of 2016. On the user adoption front, it said that growth in first half engagement was driven by product launches and increased adoption rates among older demographics (read: olds). Still, it’s weird to blame stagnant growth in one quarter on fast growth in the prior quarters. A more satisfying answer comes in the form of technical issues Snap fessed up to introducing through product updates in mid-2016. “We believe these performance issues resulted in a reduction in the growth of our Daily Active Users, particularly among Android users and regions with a higher percentage of Android devices,” it explains. Having a buggy app will indeed slow growth, particular in places where Android has a larger share of the market, wireless data transfer is not as fast, or data costs are high. That goes on to explain in part why growth in the “rest of world” might be so slow. Most tellingly, Snap acknowledged that it faced competitive threat from “increased competition both domestically and internationally in 2016, as many of our competitors launched products with similar functionality to ours.” Read between the lines, and it’s clear that Instagram Stories is stealing Snapchat’s users after all. As for how Snapchat stacks up: The easy and somewhat obvious comparison to make is to Facebook, which is by far the largest social platform and has the largest user base. In its earnings report Wednesday, Facebook said it has 1.2 billion daily active users, who spend an average of 50 minutes per day on its different apps and services. The Facebook comparison is imperfect for a few reasons. First, Facebook counts user and engagement stats across its website and mobile apps, while Snapchat has a single mobile app. More importantly, Snapchat is only about five years old, while Facebook has been around since 2004 and has been public since 2012. But while Facebook has always seen the international market as a growth opportunity, Snap looks like it might have trouble converting new users outside of the U.S.